Terry L. Ettinger Horticulture Consulting Services - Recommended Annuals for Central New York Landscapes and Gardens. I have not yet added any annuals to my list of recommended plants. However, I can tell you that I won't be writing a lot about marigolds, petunias, impatiens and geraniums (photo at right). Rather, I'll likely be introducing you to the incredible variety and utility of what are often referred to as "tender perennials". These are tropical and sub-tropical plants that thrive in the heat of mid-summer, but aren't hardy enough to survive our bitter Central New York winters outdoors. 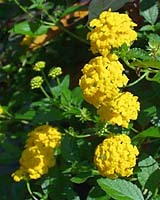 A perfect example is lantana (photo at left). It's widely planted in the south where it can often survive through mild winters. Meanwhile, in Central New York it can easily grow to heights and widths of more than three feet between May and August - with little or no watering! And, it will continue to bloom heavily right through the first light frosts of autumn!